In Richard Brooks’ film, Blackboard Jungle (1955)—the movie that demonstrated the appeal of rock ‘n’ roll to Hollywood studio heads by virtue of its use of “Rock Around the Clock” on its soundtrack—there is a white male character, Josh Edwards (played by the late Richard Kiley, right), who is a jazz music collector. A nerdy, bespectacled mathematics teacher, he collects “Swing” music. 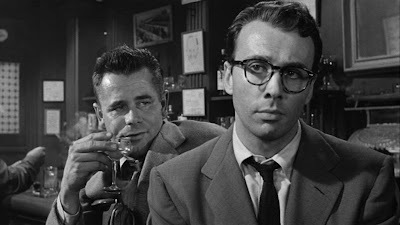 There is a scene in the movie in which Edwards, along with his fellow teacher, Richard Dadier (Glenn Ford, left), are sitting in a bar having drinks (pictured), listening to Stan Kenton’s “Invention for Guitar and Trumpet” (1952). Inspired by the recording, Edwards tells Dadier (nicknamed “Daddy-O” by his students) that he is going to play some of his valuable jazz records for his students. Daddy-O warns him that the students may not like his kind of music. In response, Edwards tells Daddy-O that he’s going to do so anyway. He says it took him many years to collect his records, and that “half” the records can’t be replaced. They are good records, and perhaps he can win over the recalcitrant students with music. His plan fails, of course. The students, led by the villainous juvenile delinquent Artie West (Vic Morrow), smash Edwards’ rare and valuable records, despite his desperate pleas to stop. Soon after this terrible event, we learn that Edwards is so emotionally devastated by the students’ act of iconoclasm that he resigns his teaching position. Apparently, he resigns because he takes their smashing of his records as a personal affront. His mistake, of course, was to presume that the students would share his musical taste and also his enthusiasm for record collecting. But what the audience understands, though, is that they smash his records because he is a weak teacher, a pushover: the destruction of his property occurs not because of the records themselves, but because he is a weak male authority figure. The symbolic affront is to his (male) authority as a teacher. In contrast, the film’s protagonist, Richard Dadier, is shown to be a strong authority figure: he is intense, committed to teaching, and has the courage of his convictions, unlike Josh Edwards, who means well, but fails as a male role model for his students. In 1966 (by which time Elvis was no longer the cultural force he was in the 1950s), during which time the Beatles were the most popular band in the world, John Lennon made his infamous remark about the Beatles being more popular than Jesus Christ. (I’ve written about this remark before, in a blog in which I argued that what Lennon really meant by his remark was that the Beatles were more popular than Elvis, but he couldn’t bring himself to say it. For John Lennon to have averred that the Beatles were more popular than Elvis would have been more blasphemous to him than the remark he made about being more popular than Jesus.) One wonders whether the backlash that occurred in response to Lennon’s vituperous remark isn’t somehow bound up, in America anyway, with the association of musical taste with weak male authority. After all, in Jailhouse Rock, Elvis didn’t say he loved music, he indicated rather a strong distaste for jazz (and snobbery), which isn’t the same thing as saying he loved rock ‘n’ roll music. Following John Lennon’s remark, in August 1966, there were a number (the precise number of which I do not know) of record burnings and the smashing of Beatles records around the United States. Thus, in 1966, a significant portion of the American population responded to John Lennon’s remark in the same way that the juvenile delinquents responded to Josh Edwards’ playing jazz records in Blackboard Jungle: by smashing his, that is to say, the Beatles, records. The motive seems uncannily the same: to undermine the Beatles’ cultural capital as authoritative male role models. The hope was to undermine their credibility in the same way the students undermined Edwards’ credibility in the 50s film.